The OECD is weighing in on the controversy surrounding whether Canada is suffering from an economic condition known as Dutch Disease, and its qualified answer is yes. The Organization for Economic Co-operation and Development warns in a report released Wednesday that the run-up in commodity prices is leading to an uneven economy in Canada. And it says the country needs to do more to develop non-resource aspects of the economy so as to maintain high levels of employment and an equitable distribution of wealth across regions. PHOTOS: WHAT IS DUTCH DISEASE? Resource-rich provinces such as Alberta, Saskatchewan and Newfoundland have prospered, while others have fallen behind, in part because a commodity boom has strengthened the Canadian dollar. A similar problem occurred in the Netherlands after its North Sea oil fields created a new source of resource wealth, hence the term Dutch Disease. "I don't think you can really deny it," said Peter Jarrett, one of the report's author, in an interview. "You can't explain the entire pattern of the history of manufacturing just by exchange rates, that goes too far, but anyone who argues it has no effect is clearly not looking at the data. The 128-page report from the multinational organization does not use the term Dutch Disease, but it traces the steep decline of manufacturing in Canada since the turn of the century and the equally sharp climb of the loonie. During the same period, demand and prices for Canadian commodities, particularly oil, also accelerated to record levels. "The export-oriented manufacturing sector had by 2011 shrunk sharply to only 12.6 per cent of total value added, down from a peak of 18.6 per cent in 2000. Its share of employment has also fallen substantially over the past decade from 15.2 per cent to 10.2 per cent, and somewhat more than in the United States," it notes. "Both outcomes have been clearly correlated with exchange-rate developments." Meanwhile, it adds: "Alberta remains the most affluent province, thanks to its energy wealth." The fact that Canadian manufacturing has fallen further and faster than the United States, where resources play a smaller role in the economy, can be partly explained due to exchange rate movements, Jarrett said. The analysis mirrors that of NDP Leader Thomas Mulcair, who has been accused of pitting regions against each other for political purposes. Other reports on Dutch Disease in Canada have tended to reach incompatible conclusions. Last month, the Pembina Institute said what it called "oilsands fever" spread benefits unevenly across the country and could be hiding economic turmoil down the road. A second report from the Macdonald-Laurier Institute argued that all provinces benefit from the commodity boom. And yet another, from the Institute for Research on Public Policy, split the difference — it found some evidence for the phenomenon, but said the impact was smaller than feared. The OECD report says there's no question the decline in central Canada's manufacturing base is correlated to the appreciation in the dollar. Economists from the organization were to hold a press conference Wednesday morning in Ottawa on their findings. 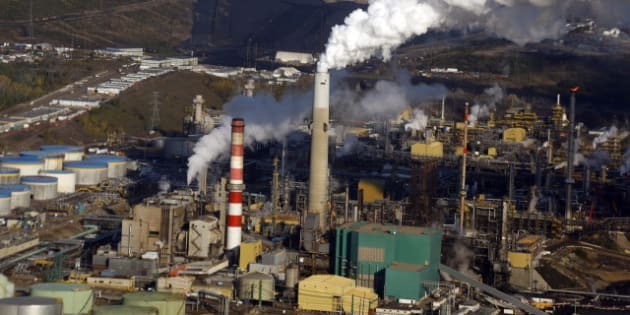 The report does not call for a for a slowing down of resource development, particularly in Alberta's oilsands, although it continues to push for a carbon tax. Instead, it advocates that Canada boost innovation and invest in churning out skilled workers. That will lead to higher productivity, which should benefit the non-resource sectors. The OECD calls sluggish productivity growth "the main long-term challenge facing Canada's economy." The report touches on a wide range of economic issues impacting Canada, including interest rates, debt, government fiscal health and immigration. It gives the most space, however, to why Canada is unable to capitalize on its highly-educated human capital to commercialize ideas and innovate. The country's productivity has actually fallen since 2002, the OECD notes with alarm, while in the U.S. it has increased by 30 per cent over the past two decades. This is apparently not a unique Canadian problem. Other resource-rich countries, like New Zealand and Norway also underperform when it comes to innovation, the report states. Many of the solutions for the innovation deficiency advocated by the OECD have been advanced before, including that businesses spend more on research and development, and that governments devote resources to post-secondary schools that turn out highly-skilled workers. But the report takes issue with some of changes to R&D funding proposed by Finance Minister Jim Flaherty in his March 29 budget. The report says Flaherty should have followed more closely the Jenkins report recommendations he commissioned by narrowing the tax credit gap between small and big companies, rather than increasing it, and by not being afraid to "pick winners" as long as firms also contribute to their own research. On the current state of the economy, the OECD says Canada has weathered the global crisis comparatively well and should grow by about 2.2 per cent this year and 2.6 per cent in 2013. But, as it has noted before, Canada faces a potential future risk over the high levels of household debt and real estate prices. "Low interest rates are for now keeping mortgage and debt-servicing affordable for most, but the share of indebted households spending more than 40 per cent of their income on interest payments remains about the 2000-2010 average," it warns. Dutch Disease: What Is It?